training capoeira angola in Salvador, Brazil. How is capoeira angola beneficial to the children? Children living in favelas in Salvador, Brazil are often facing extreme living conditions, hunger and lack of parental care. They easily fall prey to drug traffickers, or themselves start peddling drugs and engage in juvenile delinquency. Once they got on this path, for many of them there is no turning back. One way of preventing favela kids from going astray is capoeira – a traditional Afro-Brazilian dance-fight art, widely popular in Brazil and gaining popularity across the world. It develops not only physical and musical skills, but also the ability to cooperate within a group and to build one’s self-esteem in a non-violent way. Capoeira groups consider themselves families where everyone takes care of everyone else, and this sense of belonging and being supported is what kids from favelas are often lacking. We are capoeira angola students learning capoeira from Mestre Boca do Rio whom we want to help in supporting children’s group in Salvador. Marcelo Conceição dos Santos – Mestre Boca do Rio – is a renowned mestre (master) of capoeira angola. As he often tells his students, capoeira has helped him to steer clear of delinquency and become the man he is now – responsible and caring for others. Today he wants to offer the same opportunity to kids from the poor district where he comes from, living in a vulnerable life situation. Last year he started a project addressed to socially disadvantaged children and youth from the neighborhood, teaching them capoeira to keep them off the streets and make them proud of their Afro-Brazilian heritage. The project was subsidized by European funds, but the funding period has already ended. Mestre Boca do Rio does not want the kids to be left on their own again, so he has tried to partly support the group by himself. However, he cannot continue without other sources of funding. That is why we need your help. In 2014 Mestre Boca do Rio coordinated a 4 month workshop of capoeira angola for kids, combined with classes of making berimbaus (traditional Afro-Brazilian string instruments), traditional samba, and Afro-Brazilian cooking. The workshop culminated in the Black Awareness Week (Semana da Consciência Negra), with roda de capoeira, samba de roda, and lectures about the history of capoeira angola and the the situation of Afro-Descendants in today’s Brazil. A total of 30 children have participated in the workshop. They attended capoeira, samba and cooking classes twice a week. A majority of them would like to continue learning capoeira angola with Mestre Boca do Rio. Children were provided with capoeira clothes (trousers, T-shirts, training shoes). In course of the workshop many of the participating kids turned out to be undernourished, therefore some of the funds were allocated to buying food. 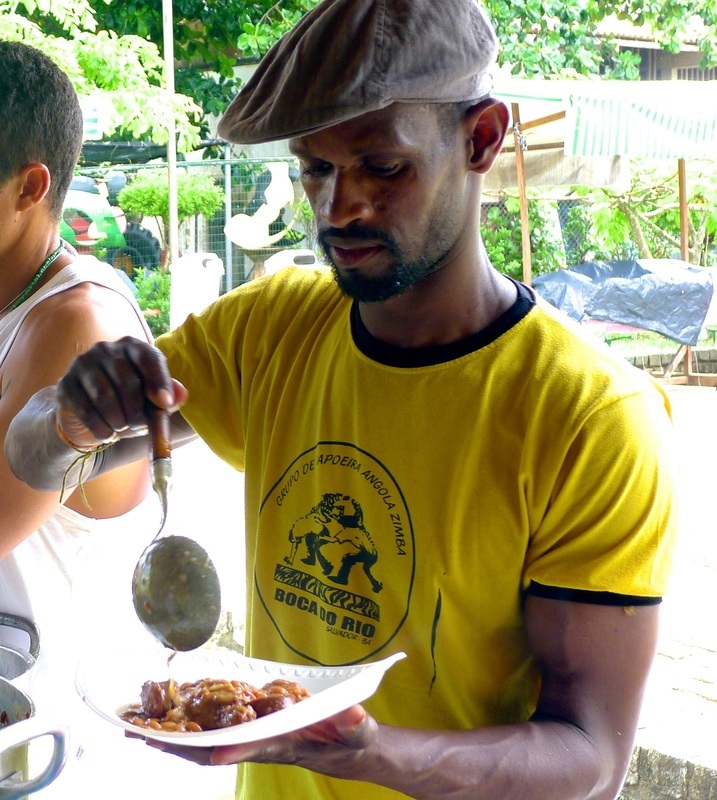 After the project and the funding ended, Mestre Boca do Rio has continued to feed children during capoeira classes. A ideia de que este projeto ira ajudar meninos que vivem nos bairros periféricos de Salvador e que necessita deste projeto pra que as suas perspectiva sejam cada ves melhor. E através da capoeira poderemos manter uma geração mas comprometida com as suas raízes. What is there to be done? Mestre Boca do Rio wants to continue and develop his work with kids from the neighborhood. We want to make the children’s group financially stable – at least for another several months.